Today the Stevie® Awards opened entries for The 13th Annual International Business Awards, the world's premier business awards competition, which attracts nominations from organizations in more than 60 nations and territories each year. All individuals and organizations worldwide -- public and private, for-profit and non-profit, large and small -- may submit nominations to The International Business Awards. The early-bird entry deadline, with reduced entry fees, is 13 April. The final entry deadline is 11 May. Late entries will be accepted through 15 June with payment of a late fee. Entry details are available at www.StevieAwards.com/IBA. An international judging panel of more than 200 executives will determine the Stevie Award winners. Results will be announced in mid-August. Stevie Award winners will be presented their awards at a gala banquet in Rome, Italy on 21 October. A variety of new categories are introduced for the 2016 competition including Technology PR Campaign / Program of the Year, and Re-Branding / Brand Renovation of the Year. The 34 Company of the Year categories have each been split into three categories, based on company size (small, medium-size, and large). 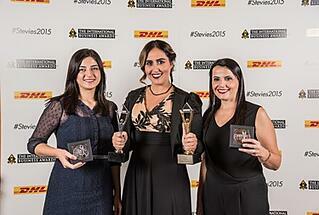 Stevie Award winners in the 2015 IBAs included ASDA'A Burson-Marsteller (United Arab Emirates), AT&T Inc. (USA), Bacardi Limited (Bermuda), Bahrain National Gas Company (Bahrain), Bell Helicopter (USA), Calik Energy (Turkey), Coca-Cola Icecek (Turkey) DHL Express (worldwide), Epicor Software Corporation (USA), Freelancer.com (Australia), Girl Scouts of the USA, iFinance Canada, Llorente & Cuenca (Spain), M3 Communications Group (Bulgaria), Ooredoo (Qatar), PR Telekomunikasi (Indonesia), RheinBrücke IT Consulting (Germany). Ribose Inc. (Hong Kong), Roshan (Afghanistan), and WNS Global Services Pvt. Ltd. (India), among others.